To kick off the recipe section, I have a share for you. It is, in my opinion, the BEST bread ever! Making your own bread too daunting a task? It won’t be after this. This bread takes only a few minutes to throw together and is so versatile. We use it all the time. 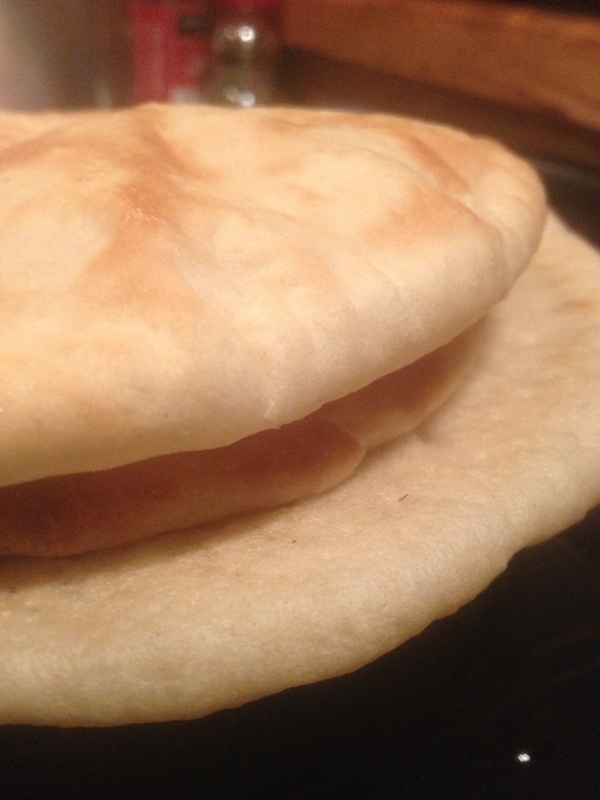 I came across this recipe for Pita Bread on the Good Eats ‘n Sweet Treats blog almost a year ago and gave it a try. I promise you’ll love this recipe as much as I do! Mix the yeast in with the flour, salt, and sugar. Add olive oil and water. Stir together until all ingredients form a ball. If dough feels too sticky add a bit more flour, and if it’s too dry, add a bit more water. Once the dough forms a ball, turn it out on a work surface and knead for 10 minutes. (I knead it right in the bowl.) Or use your dough hook on your mixer for 10 minutes. Punch down and divide into 8 equal pieces, cover and let rest for 20 minutes. Preheat your oven to 450 degrees and put your baking stone in the oven to preheat with it if you have one. (I use a baking sheet and it works just fine.) Turn a baking sheet upside down and lightly oil it. Place as many rounds on your stone or cookie sheet as you can get at a time and bake for 3 minutes. This will leave them soft and pliable. If you like them crispier bake an additional 3-5 minutes. So, that’s the basic recipe. It’s really pretty simple and can be whipped together in a few minutes once you’ve done it once or twice. I don’t do any raising beyond the initial 60 to 90 minutes and they still turn out great. I do, however, roll the dough out and let it rest for 15 minutes. If I don’t, it bounces back and I end up stomping from the kitchen like a twelve year old. It takes patience. I’ve also divided the dough into 4 pieces and made it twice as thick which gives you a delicious syrian bread. We make personal pizzas with this bread, stuff it like a burrito, tear it up and dip it in garlic sauce and hummus, and tear it in half and stuff the pocket with all kinds of good stuff. Your imagination is the only limit. 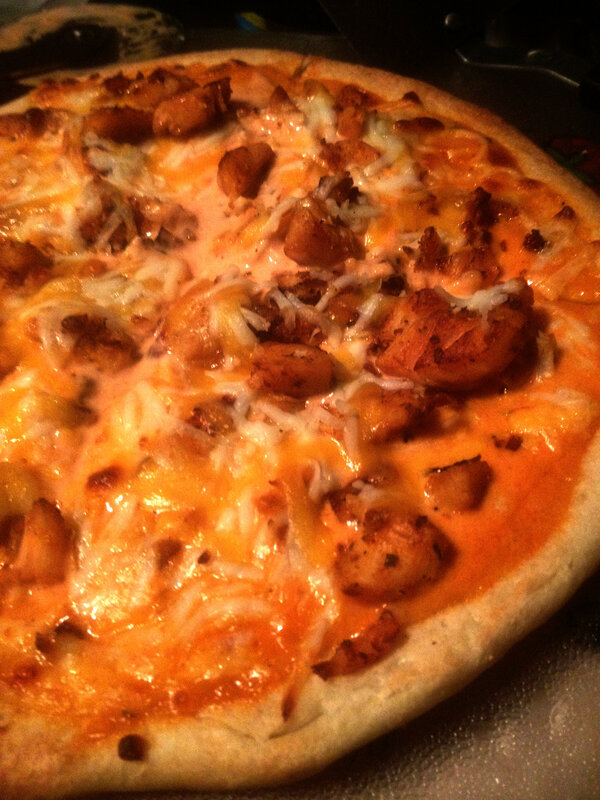 Last night’s buffalo chicken pizza. Last night we used this bread to make buffalo chicken pizza. I divide the dough into 6 portions and bake the bread for 6 minutes (we like it crispy). Then top with a mixture of ranch dressing and Red Hot mixed to your liking. Add boneless chicken breast (ours is grilled with cajun seasoning). Top with cheese (we use a pizza blend or cheddar). And bake for an additional 5 minutes at 450 degrees until your cheese is hot and bubbly or until you just can’t wait anymore. Either way. Don’t be afraid to adjust this to your liking and try new stuff with it. The worst that will happen is you’ll know not to make that again. 🙂 Enjoy! I’d love to hear how your bread turns out and all the awesome ideas you come up with!